3 Centuries of Tradition in Piano Manufacture! 1896: When Johann Nemetschke makes himself independent with a small piano workshop in the Margareten district of Vienna, there already are over 100 piano manufacturing businesses in Vienna. Some of these are widely known throughout Europe. From the very beginning, Johann Nemetschke specializes in building upright pianos, which at that time were rapidly replacing the traditional grand pianos from the living rooms of the bourgeoisie. Through innovative designs accompanied by mercantile skills of the company founder, the small enterprise starts growing rapidly in size. 1909: To enable a larger scale of piano production, a building is acquired in the Penzing district of Vienna, and the base for modernized production of pianos is set. Up to the present day, the factory building remains under company property. 1913: Shortly before the World War I, the production reaches 1000 pianos per year. 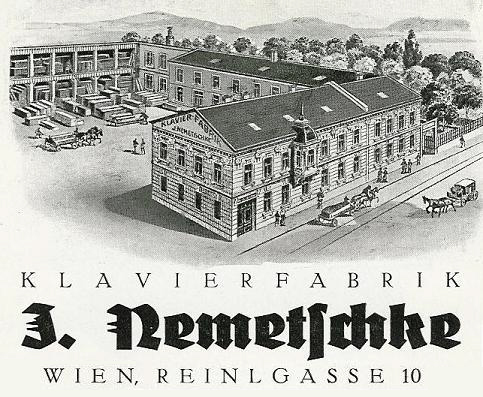 The company J. NEMETSCHKE is now one of the largest piano manufacturers of the Austro-Hungarian Monarchy. 1919-1930: The collapse of the Monarchy brings a total stagnation of the domestic market. Many Viennese piano makers give up their production. Despite the difficult economical environment, Johann Nemetschke designs new piano models and even succeeds in increasing the production by increasing export. 1930-1945: The worldwide economic crisis and political disorder makes its mark on the piano industry: Only a handful of the Viennese piano makers survive this period. 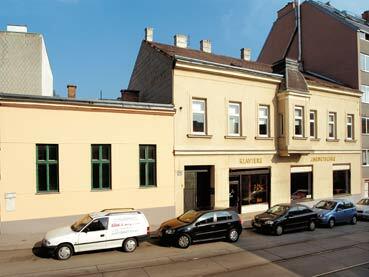 J. NEMETSCHKE manages to maintain its production by producing high quality pianos at reasonable prices. World War II however disrupts the piano production completely. Due to shortage of materials and foreign currency, the production can not be resumed in the first years following the War. 1949: The first J.NEMETSCHKE pianos after World War II are produced and a first export shipment goes to Italy. In the following years, the production remains limited to relatively small quantities. Most of the produced instruments are sold directly to private customers in Austria. 2001: First steps and intensive preparatory work for resuming the production of the original J.NEMETSCHKE piano models are taken. The groundlaying pre-condition for the resumption of the production is the requirement that the new J.NEMETSCHKE instruments should satisfy not only the distinctively superior quality in tone, touch and workmanship of the original pianos, but also should be made available worldwide at prices affordable for the majority of the population. 2003: After the first prototypes are produced and examined for their originality and quality, the serial production of the J.NEMETSCHKE upright pianos are started.